The proliferation of mobile phones is enabling more and more people to have access to a variety of lifesaving information and critical services, including sending and receiving money. However, mobile phone utilization is still relatively low in rural communities in Ghana. Factors cited as constraining wider mobile phone utilization include unfavorable legislation, the price of handsets, poor network coverage, cost of recharge cards, low literacy, and the high cost of phone maintenance. Since ancestral consultation shapes everyday decision-making among the Kassena-Nankana in northern Ghana, would it not be wise to consult the ancestors before availing oneself of the services of a mobile phone? After all, individuals employ soothsayers for contacting ancestral spirits to explain the past, interpret the present, and forecast the future on matters concerning the wellbeing of their households. Under the assumption that people are more likely to use mobile phones if they are certain that their ancestors approve of the technology, we set out to sample the views of the living and the dead, and to compare their responses. We compiled a list of all clan heads in Chiana, a fast-growing town of nearly 15,000 nestled in the hills of the Upper East region where nine out of ten people live below the poverty line. We narrowed this list down to 39 clan heads before purposively sampling 10 clan heads and their corresponding ancestors. Through the medium of divination, or soothsaying, we interviewed 20 key informants--10 ancestors and their 10 corresponding clan heads--to understand how the Kassena-Nankana (both the living and the dead) perceive the mobile phone as a tool for community development. These data could potentially motivate mobile network operators to pursue evidence-based and culturally appropriate approaches for promoting the use of mobile phones. The Kassena-Nankana worldview--like the typical African cosmovision--spans the living, the dead, and the unborn. Ancestral worship is at the center of their cultural practices. 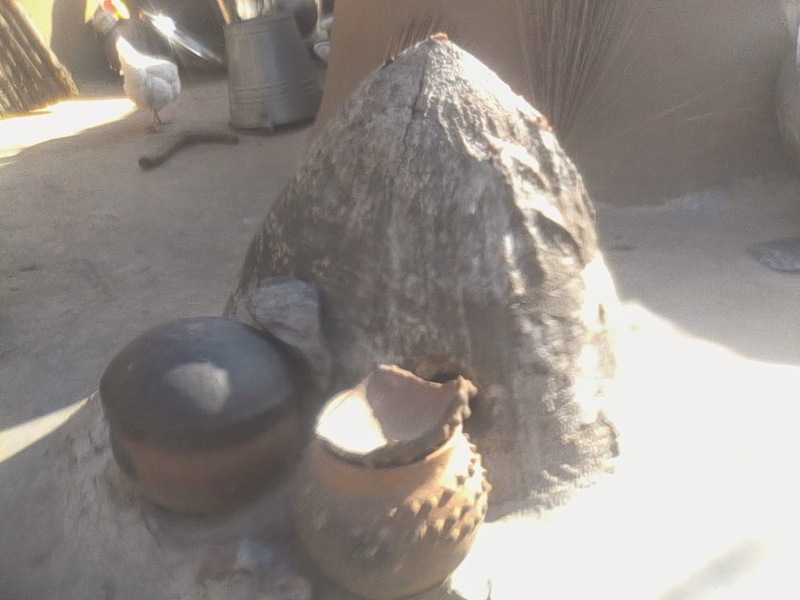 Every compound has a shrine for making sacrifices and pouring libations to the spirits of ancestors, thereby establishing links between past generations and the present. Consulting the ancestors is the responsibility of the clan or lineage head, who serves as the moral authority of the clan. If the Kassena-Nankana seek the opinion of ancestral spirits on just about anything, would they not consult the ancestors before buying a mobile phone or accepting one as a gift? And if they do decide to consult them, what might the ancestors say? What if the ancestors and clan heads do not share the same opinion about the use of mobile phones? Consultation starts with the deposit of a consultation fee--the exact amount of which is at the discretion of the client--and the statement of the mission. Our research assistant said, "We wish to consult your ancestor for his opinion on the use of mobile phones and the related issues of concern in our communities." This was followed by incantations by the soothsayer to seek the ancestor’s permission for consultation. The soothsayer said, "I was on the farm when the visitors came. You said you know [everything], that is why they are requesting your knowledge. I only assume, I cannot prophesize. This is their token for you.” He shook a gourd with items in it that made a jingling sound. Our client then chose two objects (a fowl skull and a piece of metal) from an assortment of over 150 objects from the soothsayer’s collection to represent the two options in the questionnaire. Our research assistant held one end of the soothsayer’s probing staff and asked the questions in his mind. The probing staff involuntarily hit one of the objects, and the research assistant noted the response on the questionnaire. Three ancestors and one clan head declined the interview requests, and one soothsayer also declined to play the mediating role for consulting the ancestors. The remaining nine clan heads had heard about mobile phones, and eight approved of their use by members of the clan. Two-thirds of the ancestors had also heard of mobile phones, and the same proportion approved of their use. One ancestor who said he had not heard of mobile phones thought that they were good for business transactions, while another ancestor who had also heard of mobile phones disagreed. One ancestor said that he had not heard of mobile phones or mobile money and thought they were not good, but would encourage members of his clan to use them. 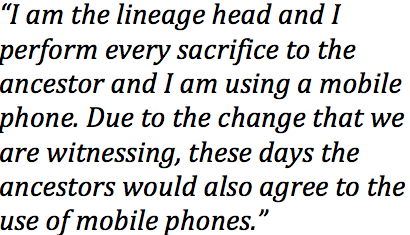 One ancestor could not make up his mind about whether the mobile phone was a good thing or not. Our study also revealed that while both the living and the dead have reservations about the use of mobile phones, the living are more positive about their use than are the dead. The ancestors probably fear that the adoption of mobile technology would diminish their importance among the living as indicated above. Though they have their strengths and limitations, mobile phones and the ancestors are both important tools for social organization. Just as mobile money is a complement to cash rather than a replacement for it, mobile phones complement ancestral consultation in strategies for problem-solving rather than replacing the ancestors. Mobile phones offer practical solutions to everyday life challenges, but the ancestors offer divine solutions to issues that arise only occasionally and that are not perceptible to everyone. The general conclusion we draw from our study is that the posture of the ancestors shows that they may not necessarily be fighting a lost battle, but rather that they are in favor of a win-win arrangement. Also, though the Kassena-Nankana are thoroughly religious and revere the ancestors, their culture is not impervious to change, including the embrace of mobile technology. They are not unaware of the changes sweeping across their traditional societies. Technology, however, is a double-edged sword. It is therefore imperative for the Kassena-Nankana to position themselves to take full advantage of the opportunities unveiled by mobile technology, but at the same time to minimize any inherent unpleasant consequences. Our study demonstrates to mobile phone companies that their clientele do not necessarily leave behind their religious and socio-cultural beliefs and practices when they embrace new technologies. Understanding this will enable these companies to develop culturally-sensitive communication messages to improve uptake of their services. Turning the lens to Mexicali, on the contiguous Mexican border with the United States, one finds people also juggling currencies. Here, making currency transactions between pesos and dollars is an everyday matter, as illustrated in this example of a so-called ‘dollar girl’ exchanging currencies for people in their cars as they wait in line to cross the border. In scenarios like this, we immediately come across everyday transactions that involve the use of differential normative, cultural, moral, and symbolic frameworks. Sandra, for example, went back to Mexicali - the city where she grew up and her parents live - after losing her house at the Imperial Valley. However, she commutes to Calexico twice a week to take care of her one-year-old granddaughter. In the same way, Sandra’s minor son, who studies at El Centro, California, lives with her sister, who cares for him. Another similar case is that of Karla, who lives in Calexico. She organizes “garage sales” in El Centro, California, and her mother, who lives in Mexicali, arrives to her house very early to care for the grandchildren. When Karla and her family go on vacation, they leave the key to their mother so that she can drop in and check the house, but overall so that she can feed the dogs. Another example concerns borrowing social security numbers. Undocumented workers can greatly benefit from a social security number, which is held by legal citizens or residents. Here, different calculations are brought into play. Those working in Mexico can lend out the social security number in exchange for unemployment benefits in times when there is no work and income tax returns. But many prefer not to use such benefits and instead profit from the work history provided by those who are using their number. In the longer term, this will be beneficial in their applications for United States citizenship. They are very careful, however, to cross the border only at times when the people using their numbers are not expected to be working. On the other hand, Mexicans in need of cash might cross the border to sell their blood (as can be seen in the picture below taken in Calexico, United States: note that it is written in Spanish, i.e. 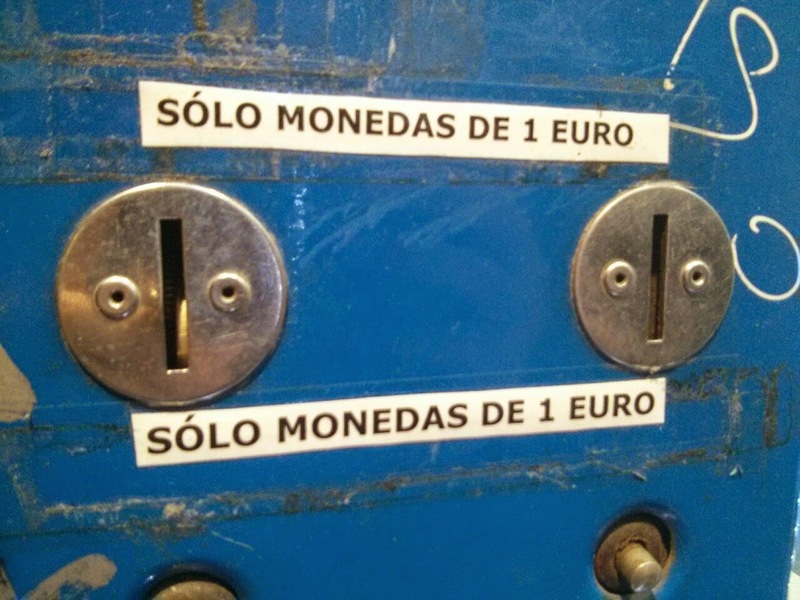 for a Spanish-speaking audience). It is also common for Mexicans to cross the border to labor in the agricultural fields, hire themselves as domestic helpers, gardeners, cleaners, assist nurses or care for the elderly, etc. as well as organize ROSCAS, buy groceries, and even cash pensions for friends for neighbors who are not able to cross to ‘the other side’, or simply as a favor. Access to information is critical in the case of employment, in which they need to be well informed about work sources, work conditions, contracts and benefits such as the unemployment compensation. Some farm workers learn how to use several social security numbers and receive “unemployment compensation” while they work in other areas, usually following “runs” or going to work “up North”. And the search for a double nationality cannot be set aside of this point. In border cities of northern Mexico, it is very common that women give birth to their children in the United States. Here, the social networks play an important role, because information concerning medical services, lodging, etc. is required. Patricia, for example, lives with her two children in Mexicali. Both were born in Riverside, California, where her brother and sister in law helped with all the necessary logistics. Even though Riverside is located 170 miles from Mexicali, her relatives had made calculations and hospitalization in this city appeared cheaper than in Indio. A week before giving birth, he and her sister in law went to pick her up and hosted her during this period, until she considered it safe for the baby to travel back. Living on the border, it is convenient to manage oneself in English as well as Spanish to be able to switch quickly between calculations in dollars and in pesos, but also to be au fait on legislation and normative frameworks on both sides of the border. The latter is a difficult task, since it not only entails reading and understanding the small print in contracts and legislations, but also being able to anticipate problems that can arise, and having the capacity to juggle with the different currencies entailed in their everyday transactions. 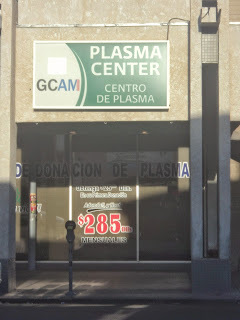 Mexican and bi-national families residing and/or working on both sides of the Mexican-American border experience and manage different monetary and social currencies, not only in peso-dollar exchanges, but also in transactions involving different means of equivalence that entail diverse normative and cultural frameworks. This is the object of our study, which we carried out in two different localities: one is the rural community of Sabinilla, in Jalisco, Mexico, which is closely linked to its diaspora in Hawaii; and the other involves commuters between Calexico in the United States and Mexicali in Mexico. The most important eye-opener for us is that people not only manage and juggle different currencies, but that they need to do so in order to make do. Those who are more adept at such juggling are the ones considered more "successful" by virtue of their relative economic stability. Let us first go to Sabinilla, a village located deep in the heart of central-west Mexico. We are considering this village as a border community because of an almost 50 year history of migration to Hawaii. Most of the men and a handful of the women in this village have lived and worked in Hawaii. 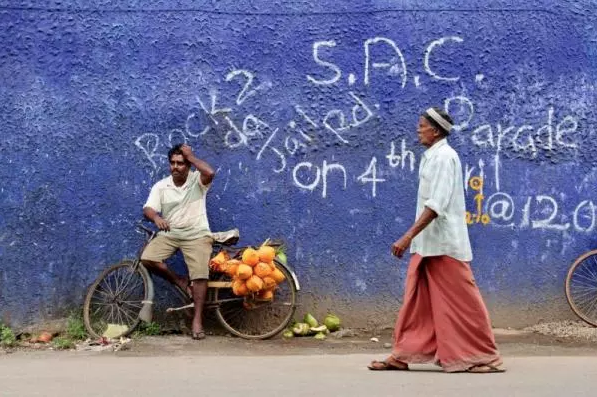 A combination of increased risk and cost in making the dangerous and illegal journey has meant that many of the village’s sons and daughters have simply not returned. On a daily basis, villagers here negotiate a world dominated by decisions and conditions far beyond their control. Yet they juggle the resources they have in order to make do. and most have close relatives in the United States who can send remittances in times of difficulty, but all resort to their own work and that of their families as the key sources of income. Children and the elderly play key roles in such endeavors. Another important resource is debt. Debt fuels household economies, making up for shortages and time gaps in income. Families can borrow a chicken, cement or bricks. But in times of great need they will ask brothers, sisters, cousins, neighbors or friends for a loan. Most emergencies have to do with health. There is no way they can pay for the costs involved in an accident or a sickness with their small liquid savings. They generally ask for loans from several people at a time (one person will hardly be likely to possess the needed amount in cash). If the money is required immediately, they will resort to their local networks. But networks cross national borders. Uncle Chelo, for example, is now 77. He was short on cash for his team of ten men and to pay for the tractor needed to harvest his ten hectares. He simply called his son in Hawaii. By cell phone, Uncle Chelo--three hours from a city and half-an-hour from a store, on a dusty, rocky river-crossing in Mexico--can borrow money from his sons, brothers, cousins and nephews and nieces in Hawaii. Chelo had debt with a local credit union, and he sold a few cows to pay it off, but in the end it was his son who provided the money that allowed him to harvest his crops. Like Uncle Chelo, most sell assets to pay back loans: cows, pigs, houses, and trucks are used in these cases, depending on the amount of debt. Money does flow from, but also to the United States. However, most often people will resort to migration to cover their debts, especially if the amount they owe is high. Here they need to ask for another loan in order to make the journey. Such loans are generally provided by their relatives in the United States. We must point out that debt is also used as advanced savings. People can build a house with loans and then pay little by little. Some have had to work for three years in the United States to pay back debts acquired to build a house or buy equipment. Different normative frameworks are brought into play with the use of debt and other resources such as cattle, land and labor. 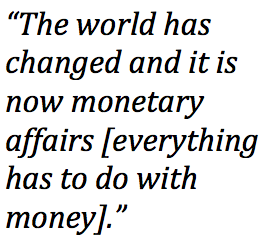 Money is signified differently within different domains. For example, land is not necessarily valued in monetary terms, and when it is, its price might be considered in pesos and/or dollars. And debt, of course, entails a host of social relations that are assessed according to the nature and context of the bond. 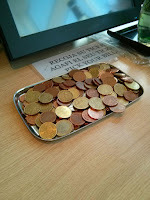 Here we find different currencies at play. 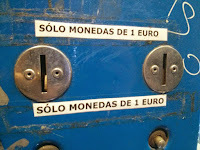 Some people are more adept at juggling these different currencies. Bacho, who recently returned from Hawaii, has been able to skillfully operate his networks. He makes agreements and semi-commitments throughout his working day as he encounters people or they call him. He labors as a field worker, grinding corn stalks as part of a crew; as chef in a nearby restaurant, making cheeses for his father-in-law; and as a tradesman, building and restoring custom wood and ironwork. But Bacho is forever calculating the production capacity of his turkeys in eggs per week, or his cows in liters of milk per day and calves per year. He anticipates the value of raising breed dogs and organic chickens, two of his favorite projects, which he started operating but hopes will grow with the increasing demand for them in nearby cities. Too Good to be True? : Is the Global Findex survey overstating growth in financial inclusion? Since it was published a few weeks ago, the World Bank's 2014 Global Findex report has made a splash in media around the world. It found that financial inclusion grew from 51 to 62 percent between 2011 and 2014, a shift that represents a total of 700 million people worldwide. But according to Daniel Rozas and David Roodman, there are reasons to be skeptical about this apparently massive growth. U.S. unbanked population drops from 12 percent to 6 percent in 2011-14; Eurozone cuts number of unbanked from 9 percent to 5 percent, according to report." Read more at the full post on the NextBillion.net. The Consultative Group to Assist the Poor (CGAP) have released a new database on financial inclusion called the "Global Findex. "The database covers 800 indicators and draws from survey data covering almost 150,000 people in 143 economies. BUT! luckily you don't have to trawl through all that data (although you could), CGAP have created a handy summary of their "10 insights on financial inclusion from the 2014 Global Findex." You can also access the full report and interact with the data. Photo Credit: Brett Davies, 2014 CGAP Photo Contest. 2. The gap between rich and poor in account ownership is shrinking – but still persists. 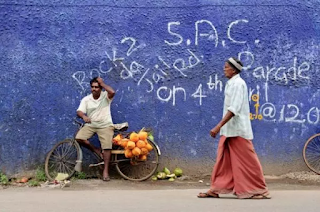 In developing economies, 46% of adults living in the poorest 40% of households have an account – up from 29% in 2011...."
Read the full blogpost on CGAP. 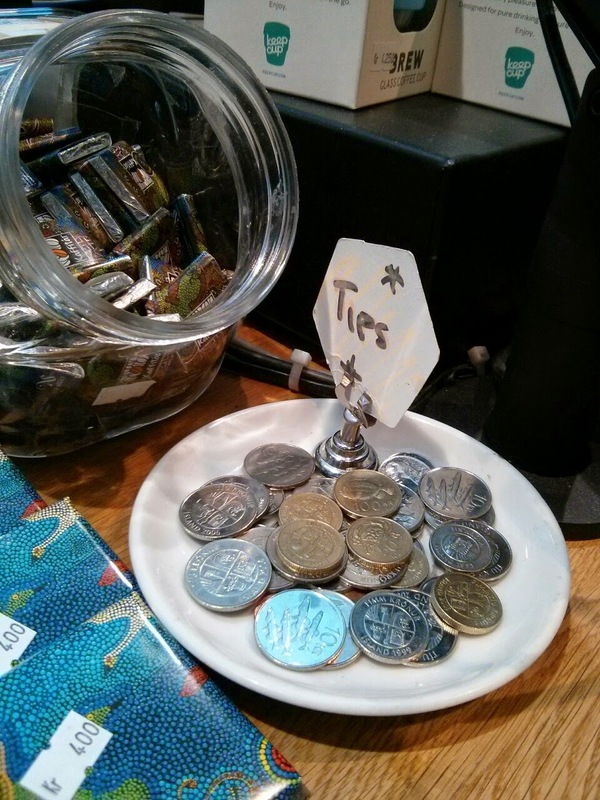 IMTFI is pleased to cross-post this blogpost with TRANSACTIONS: A Payments Archive. 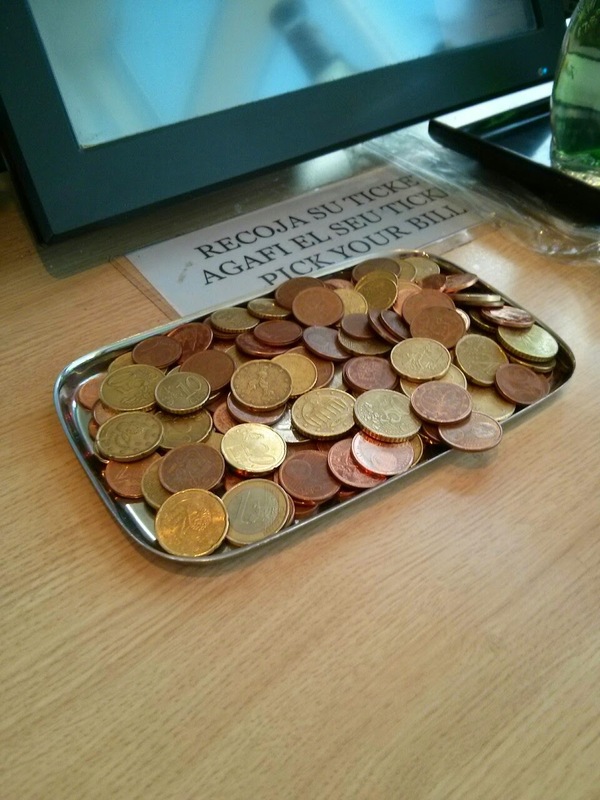 I started a photo blog called Payment Surfaces in July 2014 to explore the everyday context of payments. When used as a noun, the word surface means “an outside part or layer of something.” When used as a verb, it means “to appear or become obvious after being hidden or not seen.” I hadn’t thought about this distinction until Taylor Nelms, one of the organizers of TRANSACTIONS, pointed it out, but it captures the essence of what I originally set out to do: To capture the protruding edges of an otherwise subterranean and increasingly invisible payments ecosystem that everyone interacts with every day. People add notes to payment surfaces for various reasons. In the examples below, annotation has been used to show a customer where to swipe their card, to help a customer calculate the total cost of a service, and to make sure customers only use coins of a certain denomination. All three appear to be in response to some design element that’s not obvious. 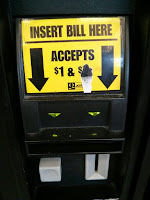 In other examples, I’ve seen businesses use notes on self-checkout lanes to promote social media engagement and solicit feedback, and to prevent customers from using mag-stripe cards at an ATM. 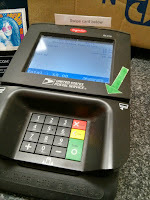 Design question: How might we enable a business to add and/or edit a note on a payment surface? 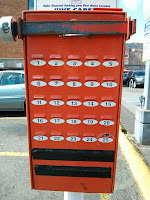 Images from Seattle, Washington, Cheboygan, Michigan, and Barcelona, Spain, respectively. Business owners want to adapt their payment systems to suit their specific needs, preferences, or processes. In the examples below, configuration has been used to encourage customers to use only $1 bills, to make the number of payment slots match actual inventory, and to discourage customers from paying by card. 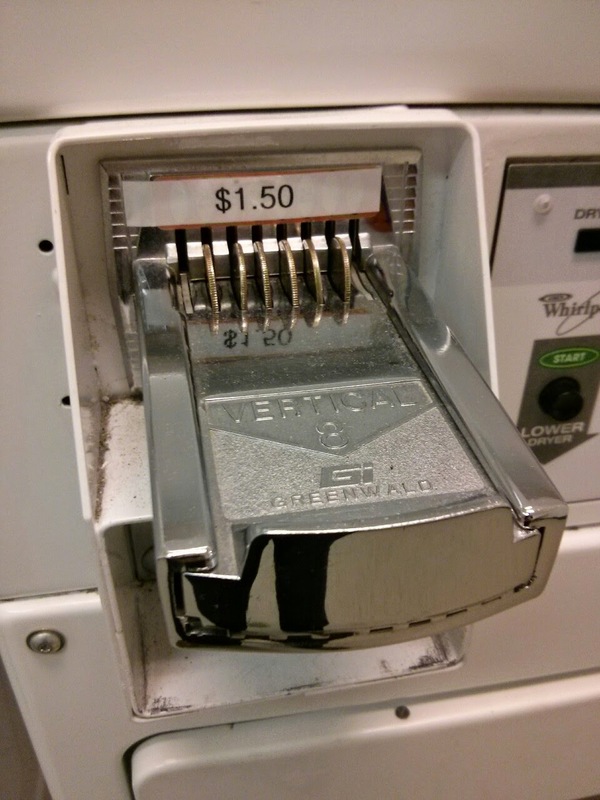 If I were to guess the purpose of each, I would say that the first is to decrease maintenance costs by limiting how much change a customer gets, the second is to mitigate user error (i.e., customers putting money in unassigned slots), and the third is to minimize card fees. 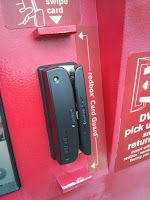 Design question: How might we enable a business to “toggle” the features of a payment surface from one state to another? Images from Seattle, Washington, Seattle, Washington, and Orange County, California, respectively. 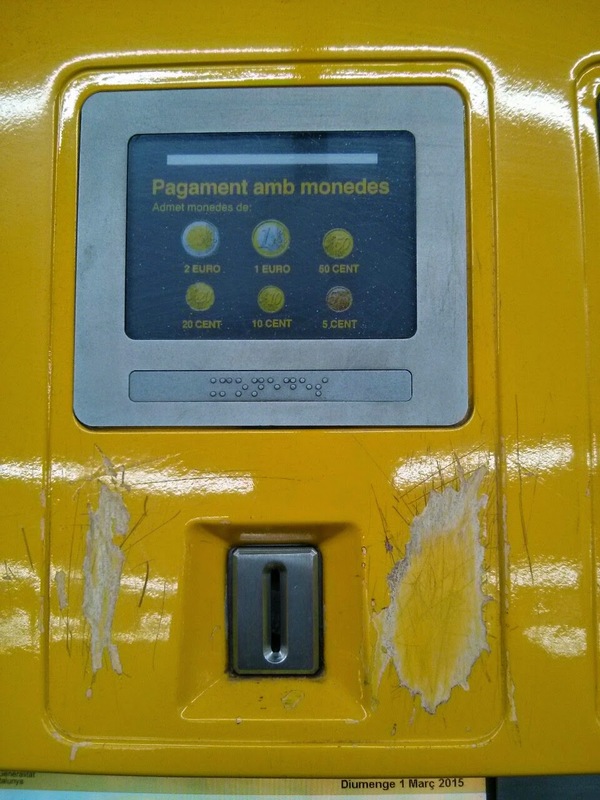 Just as language changes from one place to another, so too do the ways payment surfaces are communicated. Whereas Americans are used to large tip jars, for instance, citizens in countries with higher-denomination coins are used to smaller tip plates and tip boxes. 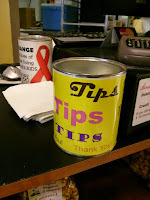 Although the purpose in these examples is clear (i.e., encouraging customers to tip), the double effect may be to discourage non-locals from leaving larger tips (like a €5 note rather than loose change). 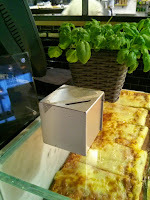 Design question: How might we enable a payment surface to adapt to a specific culture or environment? 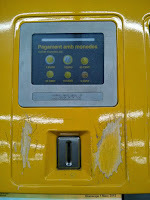 Images from Barcelona, Spain, Keflavik, Iceland, and Frankfurt, Germany, respectively. Businesses want to nudge customers to act in a specific way. 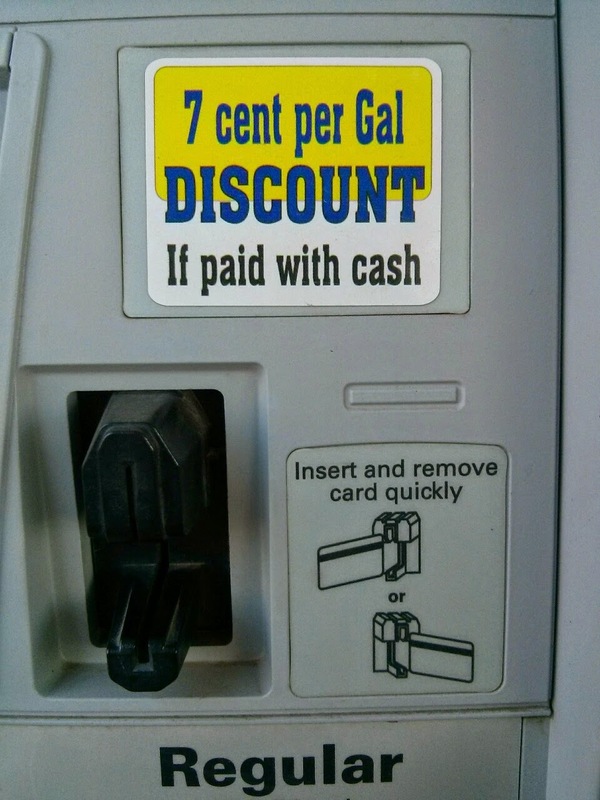 In the first example below, a petrol station offers a 7% discount to nudge customers to pay via cash. 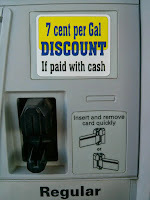 In the second, a petrol station uses choice words (“Welcome” versus “Accept”) to nudge customers to pay via a Shell Card. 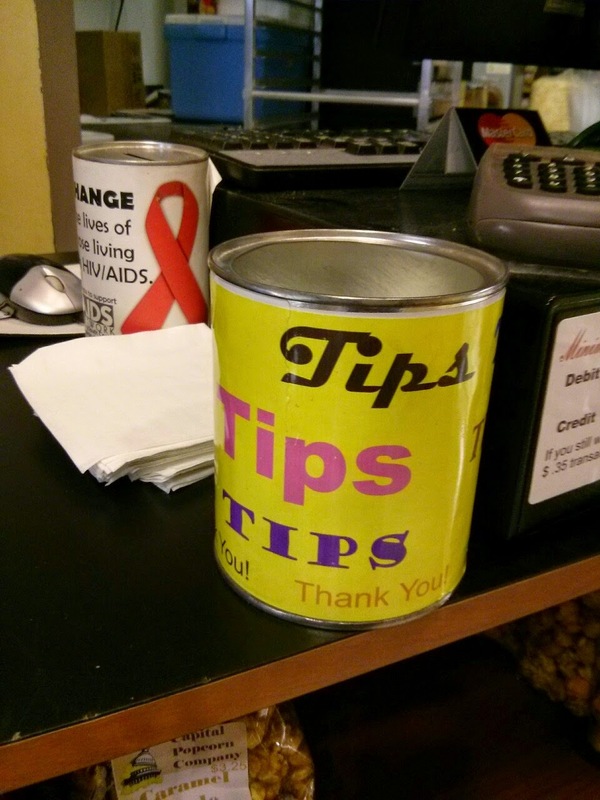 And third, a cashier gives priority placement to a tip jar over an HIV/AIDS donation jar. 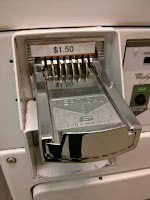 The business’s (or cashier’s) preference is clear in all three examples. 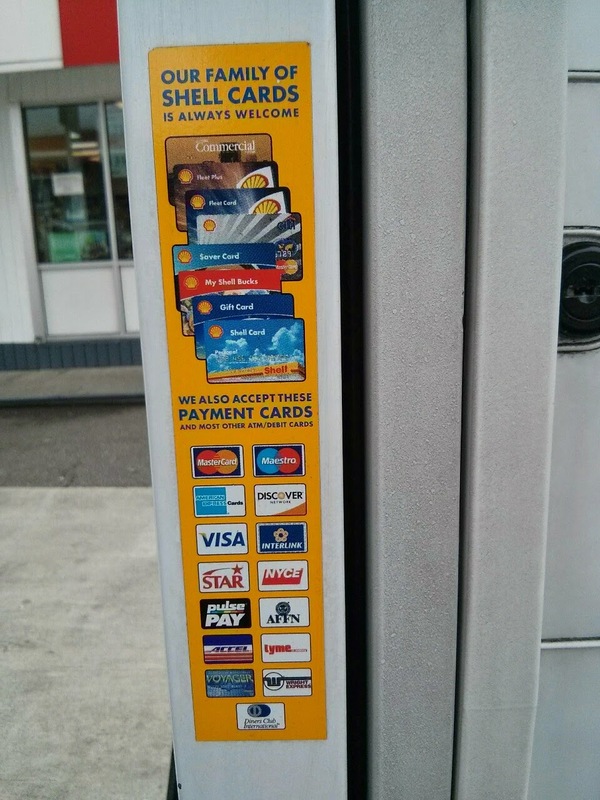 Design question: How might we enable a payment surface to entice/solicit a certain action? Images taken along Interstate 90, USA. Despite our best efforts, we can’t precisely control a user’s hand. 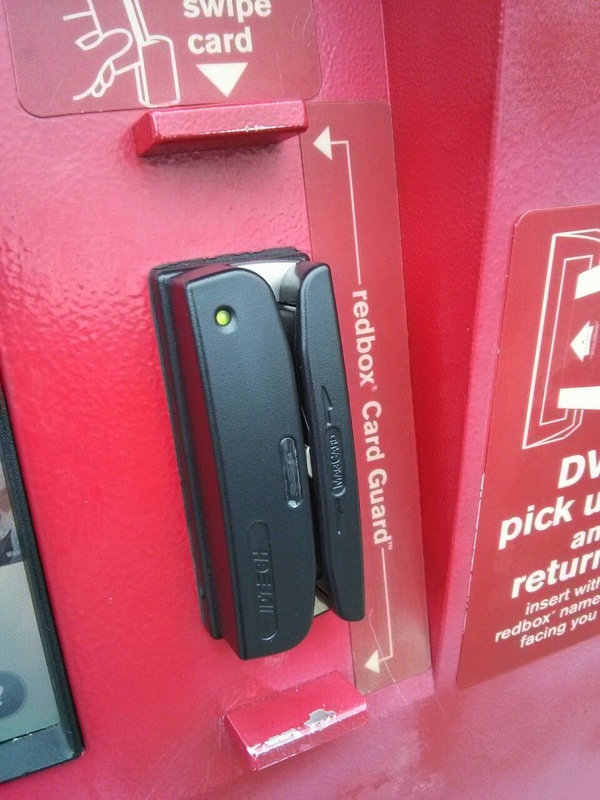 In the examples below, you can see where commuters tap their coins while navigating the ticket selection screen below the frame, or hit their card against the “Card Guard” while paying for a DVD. The first example occurs when one of a user’s hands is idle. The second occurs when a user’s hand strays from the intended course. 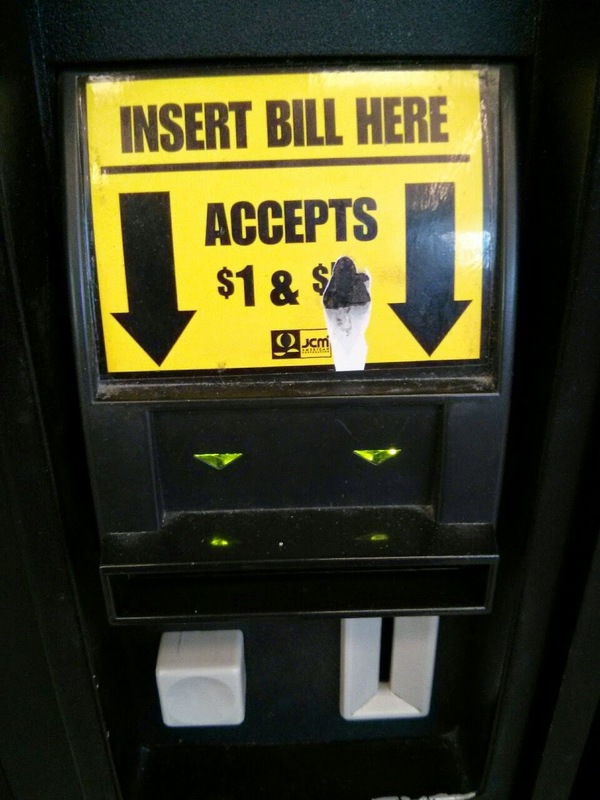 Design question: How might we design payment surfaces to accommodate idle or straying hands? Images from Barcelona, Spain and Seattle, Washington, respectively. Please feel free to share your own insights or pictures. I’m happy to re-post relevant pictures with accreditation. You can follow Ben Lyon on Twitter at @bmlyon. 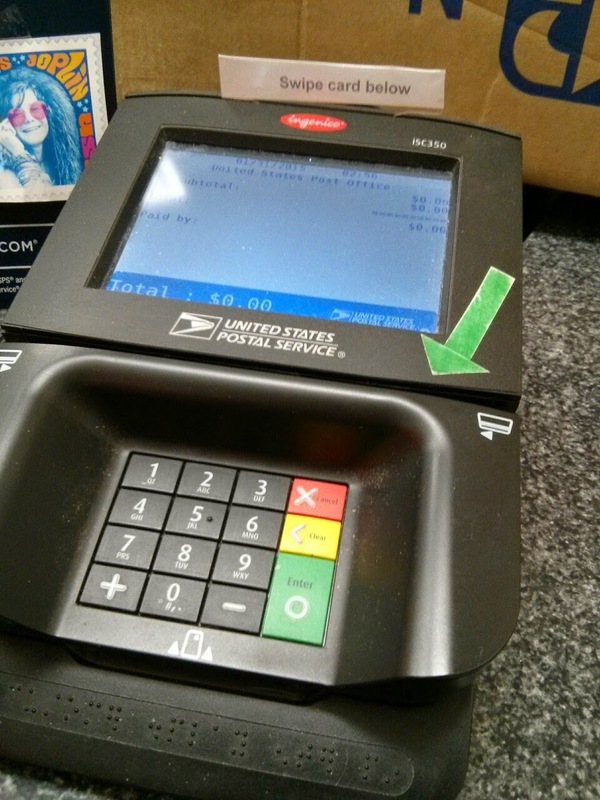 The imprinter gestural system, otherwise known as "the swipe" in payment transactions, is on its way out according to our Director, Bill Maurer. 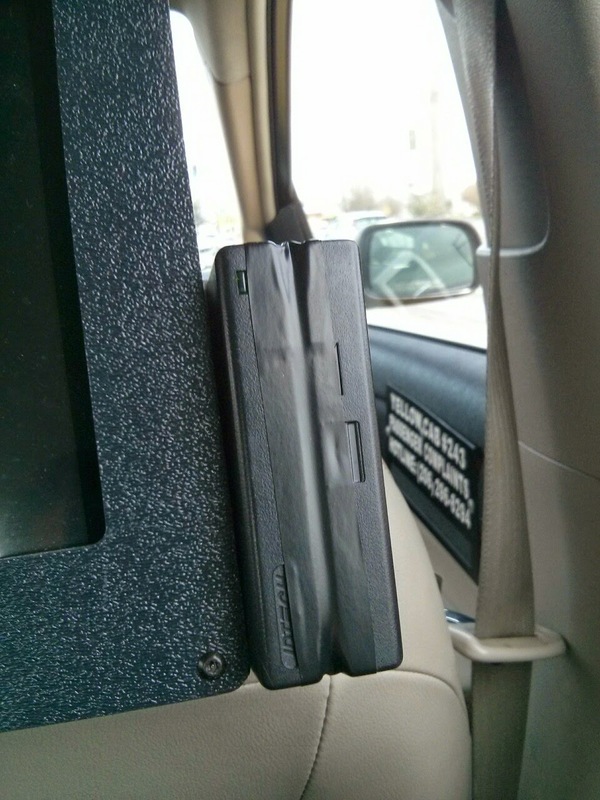 Check out the featured article over at Visa's tumblr. "Anyone remember the knuckle-buster or zip-zap machines as they were called? Those old credit card imprinters made by companies like Farrington Manufacturing (now defunct) and Addressograph (still in business and making military dog tags). If you were a merchant, you used it like this: you placed a sales slip, made with carbon paper, into the device along with your customer’s credit card. 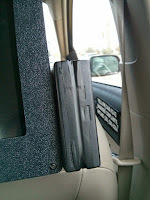 The device had an embossed metal plate containing your business’s account and address information. With a right-left swipe of the handle, it would mark all of the information needed to initiate and verify a transaction...."
Our research area consists of two municipalities--Urmiri and Chayanta--located in the northern area of Potosi, one of Bolivia’s nine departments. 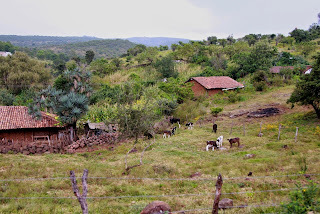 The municipalities chosen have two of the highest indices of poverty in all of Bolivia and most of their economic activity is derived from subsistence agriculture and/or livestock. These two municipalities are also fairly difficult to access: The inhabitants of Urmiri must travel one hour and forty-five minutes by bus through very rough terrain to reach Potosi, the nearest urban center, while the inhabitants of Chayanta are thirty minutes away by bus from Llallagua, a medium-sized mining town. We were able to gather information from these two communities regarding their use of Tigo Money through participant observation and by conducting over 500 surveys and 69 interviews with its inhabitants over a period of four weeks. We also spoke to Tigo Money Service Point attendants and professional experts in the areas of communication and technology in Bolivia. Tigo Money: How does it work? What makes Tigo Money appealing to the Bolivian rural population is that its users do not have to be formally affiliated or fill out any paperwork, something that requires a great deal of time and effort. Tigo Money only requires its clients to present their national identification cards and visit one of Tigo Money’s 1,174 service points, 39% of which are located in rural areas throughout the country. Our results show that 20% of respondents in the research areas (24% in Urmiri and 17% in Chayanta, respectively) utilize Tigo Money to receive money. 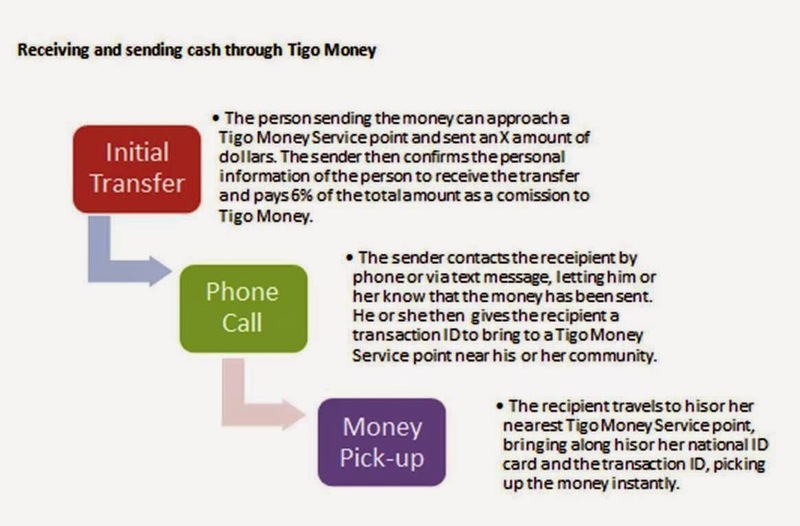 There was only one recorded case of a user utilizing Tigo Money to both send and receive, but all of the other respondents in our study reported having never used the service to send money to anyone, anywhere in Bolivia. 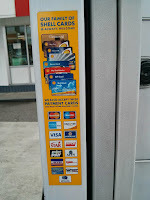 Of these, 100% use the service to receive money. However, Bolivian Tigo Money users face a big hurdle in that Tigo's mobile service coverage does not reach the most rural areas of Bolivia, including Urmiri and Chayanta. The government-owned telecommunications company ENTEL, on the other hand, is mandated by General Law 164 (2011) to provide coverage to all areas of Bolivia, both urban and rural. The cost of a phone call via ENTEL is US$0.17 per minute and the cost of a text message is US$0.02. For this reason, the Tigo Money users in our study almost always utilize ENTEL as a carrier when engaging in Tigo Money transactions rather than Tigo's own mobile service. 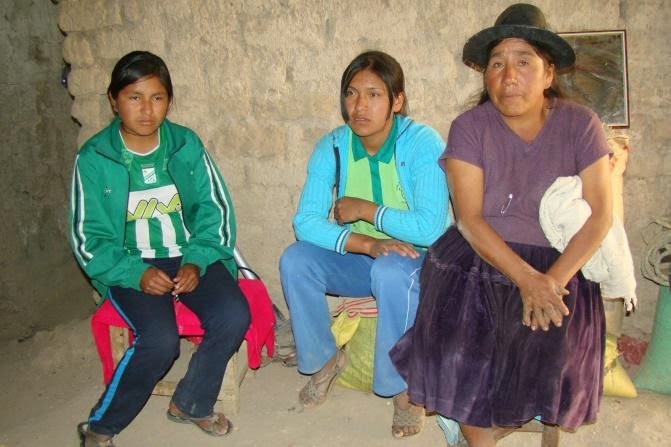 Family members located in the urban centers of Bolivia let their relatives in Urmiri and Chayanta know about the money transaction through a phone call or a text message sent to their ENTEL cell phones, and then the recipient travels to his or her nearest Tigo Money point and picks up the money. As a result, Tigo describes Tigo Money as “a mobile payment system that allows [customers] to transfer money in a simple and secure way through a mobile wallet that is activated through a cell phone.” It is via this mobile wallet that users may transfer mobile money to other mobile wallets and then convert the electronic money into physical and legal tender, but in reality, users in rural areas see Tigo Money as mobile money service used primarily for receiving informal cash transfers. We found that most of the recipients of payments using Tigo Money are women. Why? The data show that there is a relationship between Tigo Money, migration, and care networks. In fact, we found that there were very few women between the ages of 30 and 39 living in the research area, primarily due to the internal migration flows from rural to urban centers. If these female migrants to urban centers are the ones to send money, who receives it? Based on interviews and observations, we concluded that the recipients of this money are mainly women older than 39, namely grandmothers left caring for the children of migrant parents. 1) An improvement in the eating habits of the recipient households through the diversification of their daily diet related to having more income to spend on food other than the few staple foods locally available and grown. 2) An improvement in education. A significant number of interviewees pointed out that they use the money received through Tigo Money to pay for college. Others also pointed out that they are saving the money to send their children to school. 3) Increased short and long term investing. In the short term, commercial activities such as purchasing and reselling canned goods, pasta, flour, sugar, and others have been incorporated into the economic activities of the communities' inhabitants. In the long term, the purchase of agricultural technology such as sprinkler systems and greenhouses aims to improve agricultural productivity and set a goal beyond subsistence farming. 87% of all Tigo Money users surveyed thought that Tigo Money’s fees were too high, with one respondent even suggesting that “the government should provide this service for free.” So now we must ask the question: Why Tigo Money and not formal banking? The research suggests that it might have to do with rural inhabitants' overall distrust of formal banking coupled with the lack of familiarity with new financial rules and regulations. 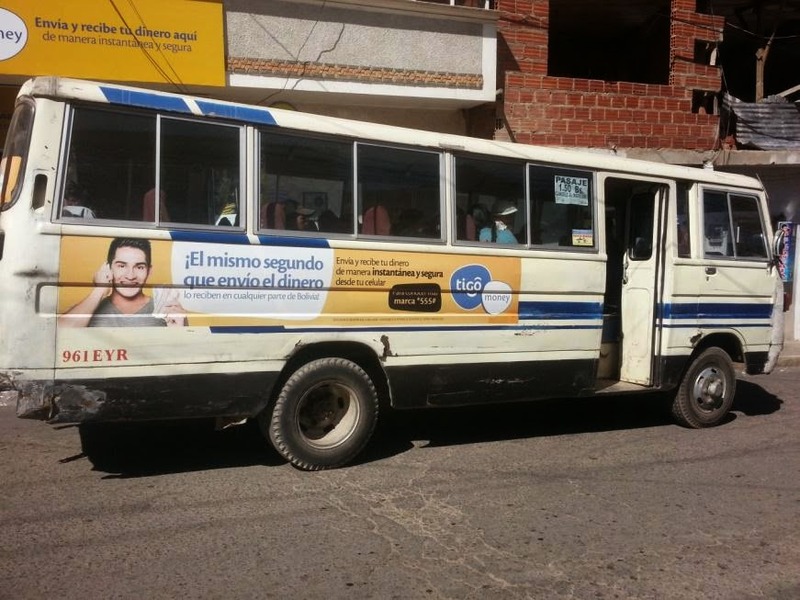 Tigo Money launched a very aggressive marketing campaign that has reached, with its flyers and advertising posters, even the most remote communities of the Altiplano region, something that traditional banks have failed to do. While we were in the midst of doing our research, Law 393: Financial Services Law was put into effect in 2014. The law specifies that formal banking institutions must make all of their services universally acceptable. Consequently, banks must now be free for customers to use without incurring any additional maintenance fees. Although clients need a minimum of US$8 to open an account with PRODEM--the bank with the most presence in rural areas--no minimum balance is needed to maintain an account. These changes mean that PRODEM, and similar formal banking entities, are just as convenient, if not better and perhaps cheaper than Tigo Money, as Tigo Money requires users to pay a fee for each transaction. It will be interesting to see how this new law affects the mobile money landscape in Bolivia in the years to come. The “shared account” is my translation of the kind of “public accounting” (raijor hisap) that goes on in Mayong. These accounts are publicly debated in the first instance: ledgers are filled with names, dates, formal resolutions, descriptions of events, and eulogistic or baptismal forms of narration. They also very often coincide with and adopt the form of liturgical rites. Indeed, they create a kind of detailed historical record (almost a chronicle) of the history of kinship, social life, and ritual eventology in hamlets, villages, and in the supralocal kingdom. While the figure of the sorcerer dominates the mise en scène of the “secret account,” it is the figure of the king and his analogues (big men, chiefs, politicians) that dominate the “shared account,” and with good reason. For if secret accounts are hidden mnemonic devices meant to aid or protect a memory of an event from becoming a shared memory, and potentially at risk to sorcery or some other threatening source, then shared accounts, which by virtue of their publicness are always open to audit, need a person of authority to control the interpreting and shaping of that shared memory. Indeed, auditing by chiefs and kings and “big men” (dangor manuh) is a part of the necessary structure of shared accounts, which are not mere mnemonic devices, but mnemotechnics (in the Nietzschean sense), meaning that they inflict and audit a record and reckoning of reality, uniting various perspectives under an authoritative (and thus legally and cosmologically legitimate) form of public memory. Chiefly or kingly auditing is a blessing and includes a kind of balance sheet of proper fines and ritual proscriptions meant to control the spreading of pollution created from improper unions, broken taboos, or other socio-cosmological transgressions. Once the rites are completed, an uddhar, or pardon/exemption, is issued. Uddhar amounts to a complete change in personhood: making a stranger an intimate or an intimate a stranger. One becomes a whole other being (a different caste, a different ethnicity, a different entity) once uddhar is granted. My field notes are filled with examples of shared accounts. One of the more interesting ones comes from a life story narrated to me by my friend Diganta Timung. Diganta is a Karbi who lives in Burha Mayong. His paternal grandfather, Gonesh Oja Timung, is one of the more famous named sorcerers in the area. But the story of how that came to be—as well as the particularities of Diganta’s father’s life course—finds its narration around the concept of uddhar. Gonesh Oja was born in the area of Borpeta in Lower Assam. Work and knowledge of sorcery—which he learned from an adept bej in what is now the Dima Hasao district—led him eventually to Mayong. While there, he met a Karbi woman named Bumoni Timung and fell in love. However, Gonesh was not only from another caste/ethnicity, his paternal home was also quite distant, so when it came time for them to be married, the question of whether or not he would stay in Mayong or take his bride back to his natal home was a serious matter. I won’t go into too many details, but the choice was finally made that he would live in the house of his bride (ghor juwai, “uxorilocality”) and that an uddhar would be granted to allow him to take on the ethnicity, clan, and patriline (bongxo) of his wife, and her patrlineal descent would hold thereafter. 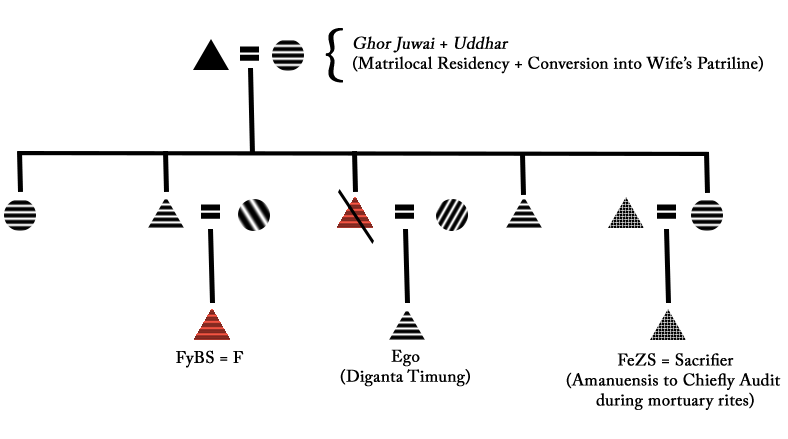 Fines were paid and recorded publicly, rituals that erased pollution were completed, a new name was taken, and Gonesh Oja became Gonesh Oja Timung, a Karbi man (see Figure 3.1). Gonesh and Bumoni had many children, one of whom was Diganta Timung’s father. He expired about 2 months after I first arrived in Mayong. It turns out there was a particular problem with his mortuary rite. Diganta’s father’s “life-force” or “self” (atma) was lingering in ghostly form (bhut) and was not taking a rebirth. Several sacrifices of pigs were made, as well as divination to find out if his atma had taken a new birth yet or not. Diganta’s patrilateral cross-cousin (his Father’s elder sister’s son) took over the duty of performing the sacrifices and assisting the Karbi chief (bangthai) in a particular kind of audit of Diganta’s father’s life. Since his FeZs was not part of his father’s patriline, he was not affected by the pollution resulting from death in Diganta’s lineage. This audit absolved Diganta’s father of any particular transgressions in order to speed the process of rebirth along. This went on for a couple weeks until divination proved the bhut had left the house and village. A couple of months later, more divination was completed and it was discovered that Diganta’s father had reincarnated as his own younger brother’s eldest son (see Figure 3.2). 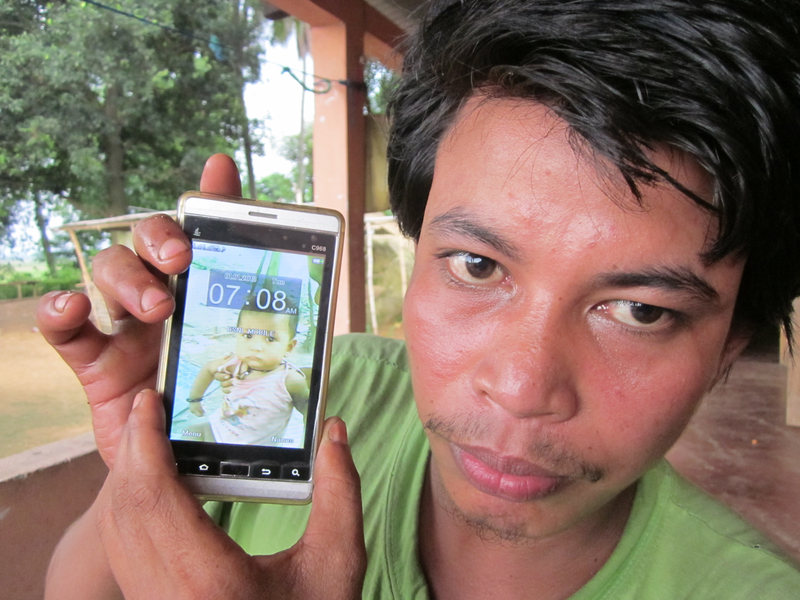 Figure 3.2: Diganta Timung (age 26) posing with a picture of his FyBS who, after divination rituals, was confirmed to have the life-force/self (atma) of Diganta’s recently deceased father. Note, as I mentioned in my second blog post, mobile phones are and should be repositories of shared (rather than secret) knowledge. From Diganta’s perspective, his father’s life and after-life required two major chiefly audits as conditions of possibility—the granting of uddhar to his paternal grandfather, and the granting of post-mortem uddhar to his father. Following basic patrilineal rules of succession and residence, none of this kind of accounting would have been necessary. Indeed, had his paternal grandfather not undergone ghor juwai (uxorilocal residence), Diganta would not be Karbi, nor would his father had to have a chiefly audit, sacrifice, eulogistic shared account, and memorial erection of the longdrang—also referred to colloquially as a kind of “life account” (jibonor hisap)—performed during his mortuary rites (see Figure 3.3), which thereby ensured his reincarnation into his mother’s patriline. 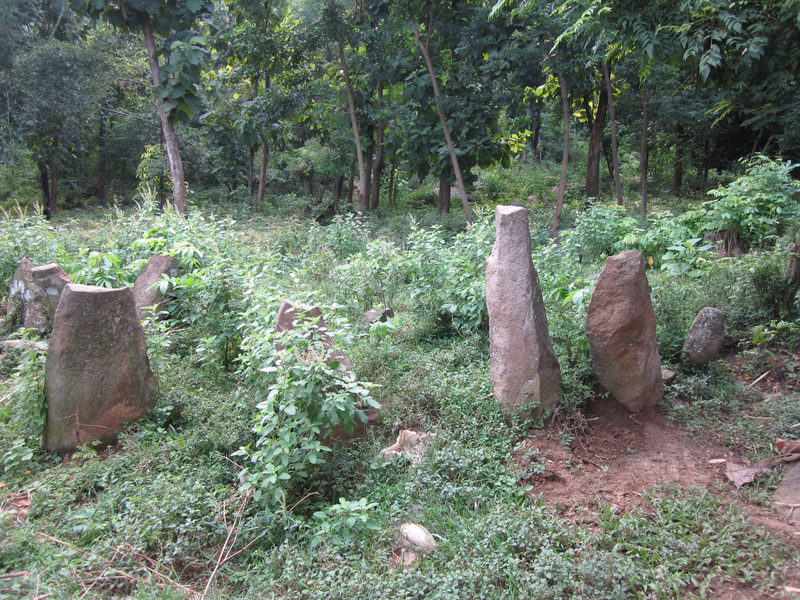 Figure 3.3: Longdrang: memorial stones of the Karbi community that are erected after a mortuary rite has been completed. The rock face is where the pig sacrifice is completed, where divination of the atma’s release is conducted (through a technique of sieving rice wine), and where the hisap (in terms of both astrological calculation and eulogistic life account) is completed. The crux of the matter regarding shared accounts, and uddhar / chiefly audits, is that these are the building blocks that come to tell the history of a place—here, of Burha Mayong. Not only do such shared accounts make abstractions like kinship and “tradition” visible, they make shared memory—history—intelligible and extendable into the future. As I will show in my dissertation, “secret accounts” are, at the end of the day, also “shared.” It is the desire for intelligible signs of history (goroka), for a reconciliation of individual experiences with the experience of the socio-cosmic whole, that consistently pushes the private and secret into the public and audited. For the private was never really “private” all along. In a pragmatic sense, however, the distinction between shared and secret accounts remains a very real one for Mayongians. For even if there is an ultimate attempt to include others’ intentions, experiences, values, and resources into a collective sense of history, inclusion itself is always a risk. The more that accounts are shared (open, audited), the more one’s livelihood is available for manipulation by others. This, in turn, has a lot of implications for matters of financial inclusion. Banking—whether conducted through mobile money platforms or not—has to be understood as a function of different modes and methods of accounting—and not merely of saving and paying—in places like Mayong. Programs for financial inclusion stand to benefit from incorporating these differences into their technological and infrastructural designs. Accounting “differently” (and not simply “better”) also means embracing aspects of so-called “informal” economies and extending the meaningful and practical applications of accounting beyond the economic domain. A need for secrecy in some contexts is thus only part of the story. The “poor” in Mayong use accounting techniques and idioms for dealing with ritual and political life, embracing or combatting sorcery, and for understanding who they are historically and in the present. In sum, accounting is not just a means for organizing and improving one’s economic condition. It is a set of arguments about how social relationships—and, indeed, the cosmos as a whole—are to be remembered, stored, accessed, communicated, and manipulated. In contexts like this, poverty alleviation has to be taken in its most capacious sense—to promote the abundance and diversity of life and its reckonings.